Sorry for another crappy bathroom photo – my photographer (Travis) was up in the mountains hunting. Only 1 more weekend and elk/deer season is over (for Travis)! Travis left for a work trip Sunday afternoon, got home around 8 pm on Friday and left for hunting at 6 am Saturday. And since he was working 14 hour days, I got to talk to him about 10 minutes all week. I was about to have a meltdown yesterday from not seeing him so I asked him to come home early to have dinner with me. We went out to eat at El Tapitio (a Mexican restaurant) and it was absolutely wonderful getting to spend some time with my husband. I so often take him for granted but not seeing him for an entire week reminds me how I love that man. 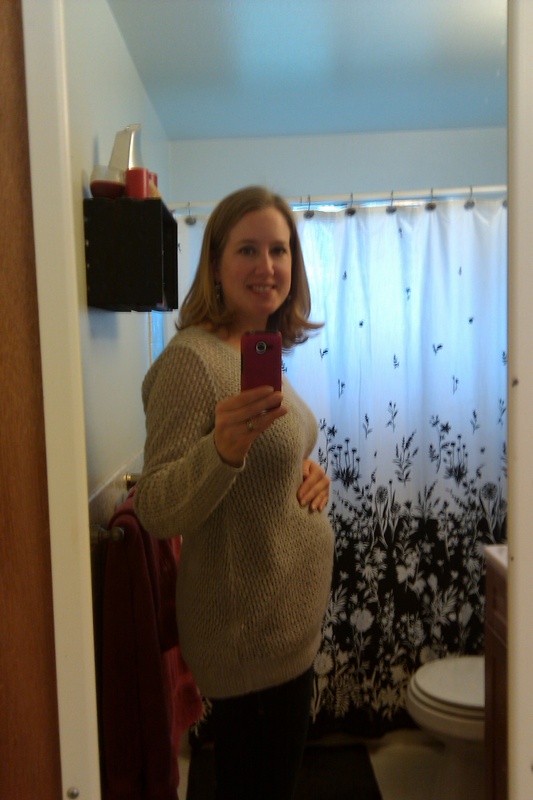 We had another prenatal appointment this morning and Travis came along to hear the heartbeat. It was reassuring and amazing just like last time. Our baby’s heartbeat was 160 bpm – which seems a little high according to things I’ve read but the doctor said it was right where it should be so I’m not worried. I also had blood drawn for the quad screen test. We opted to not do the sequential screening test at 13 weeks because it seemed like nothing much more came from it than being informed. But our doctor explained that the quad screen was also used to personalize the late pregnancy care and labor setup if any abnormalities were found. So we figured why not. Sleep: No more tummy time for me. I alternate between both sides and laying on my back with a pillow under one side so I’m tilted slightly. But I’m sleeping pretty good overall. I’m getting the quad screen done too, getting the results during the Anatomy Scan. I hear ya on the crappy bathroom pics, haha. My hubby isn’t around when I usually want to take them. Yay for feeling better & having more energy! It’s great of you to volunteer now that you’re probably not feeling like racing too much. Hope the weeks keep going well. Wish girl, 24 degrees?! That’s insane, I’m not sure if I already for that weather, yet. Let alone our baby for that matter haha all we have are short sleeves onesies and maybe two zip up sweater jackets! Hope you get to be with hubby more often, soon! Oh Mexican food… How I crave thee. Glad to hear your energy is back. Mine comes and goes it seems. One day I feel all energized and the next i feel like I need to take a nap. you are so adorable! such a fab journey you’re on!